Линза – плита – гриль. | АРТищев Андрей Борисович, к.э.н. Линза – плита – гриль. Many of us will be firing up our grills this weekend for some well-deserved barbecue time. After all, barbecuing is one of America’s greatest pastimes, but it certainly isn’t one of our most environmentally friendly. Whether you prefer charcoal, wood chips or propane, grilling releases emissions and contributes to poor air quality. Up until now, solar powered grilling has required, as you might expect, the sun, which means traditional fuel-fired grills are required after sunset. But new solar technology developed by MIT professor David Wilson could bring a nighttime solar-powered grill to the market very soon; an invention also of great benefit to those in developing nations who rely on wood to cook all their food. 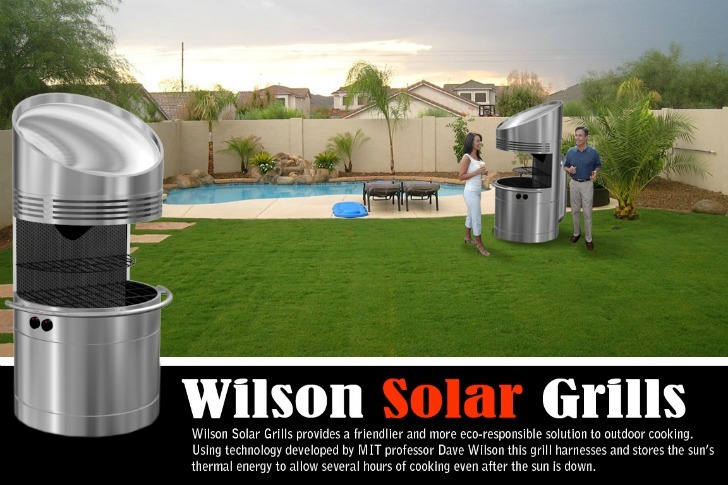 Wilson’s technology harnesses the sun and stores latent heat to allow cooking times for up to an amazing twenty five hours at temperatures above 450 degrees Fahrenheit. The technology uses a Fresnel lens to harness the sun’s energy to melt down a container of Lithium Nitrate. The Lithium Nitrate acts as a battery storing thermal energy for 25 hours at a time. The heat is then released as convection for outdoor cooking. “There are a lot of solar cookers out there,” says Wilson, “but surprisingly not many using latent-heat storage as an attribute to cook the food.” Wilson developed the idea after spending time in Nigeria, where wood is used for cooking, which causes a number of problems. Not only is cooking with firewood leading to respiratory illnesses, but is also increasing the rate of deforestation and women are being raped while searching for wood. A group of MIT students are working with the technology to develop a prototype solar grill. Derek Ham, Eric Uva, and Theodora Vardouli are conducting a study through their multi-disciplinary course “iTeams,” short for “Innovation Teams”, to determine the interest in such a concept and then hopefully launch a business to manufacture and distribute these grills. The goal is to develop a business model for distributing solar grills to developing nations as well as a grill for the American market. The American version is expected to be a hybrid propane/solar model that will allow for flame cooking as well as through thermal convection. If all goes well, in a couple years we just be giving solar grills as presents on Father’s Day and enjoying sun-kissed instead of char-broiled even after the sun goes down. Предыдущая статья: « Прощённое воскресенье.